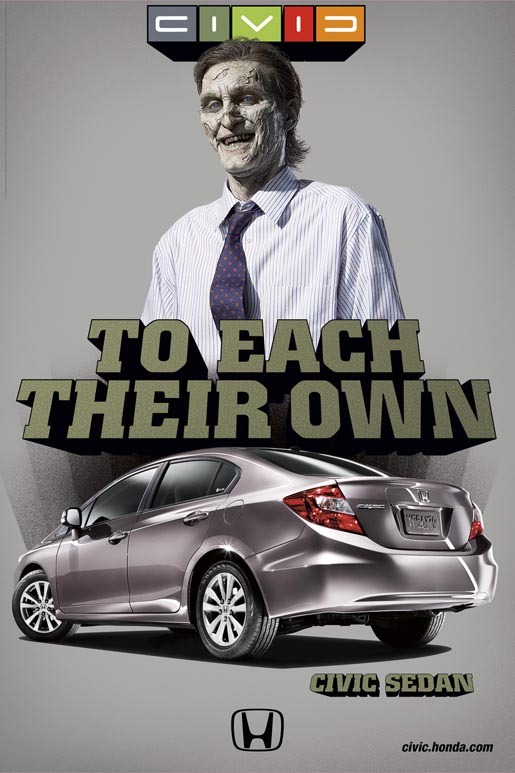 Honda is running “To Each Their Own”, an integrated advertising campaign in the USA promoting the all-new Honda Civic. 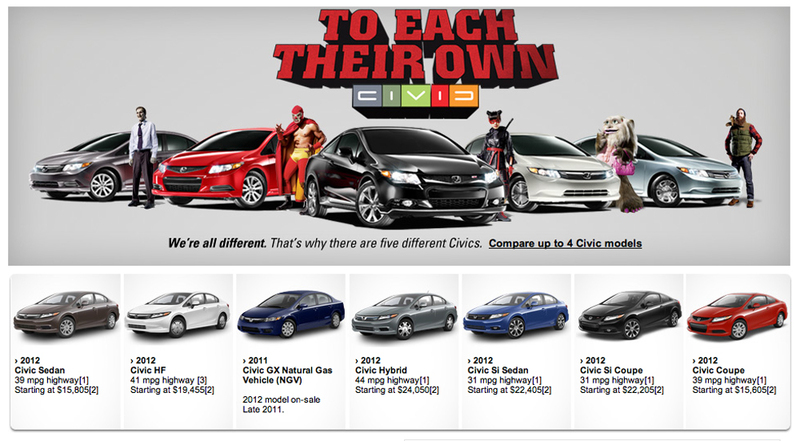 The campaign is centred on the idea that we’re all different and there’s a unique Civic for each of us. 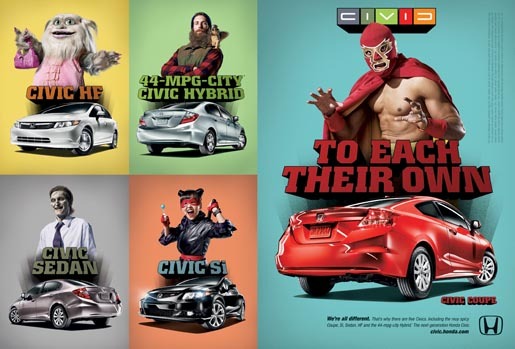 Five characters are portrayed in television and print advertising: the urban woodsman, zombie, monster, ninja and champion luchador. 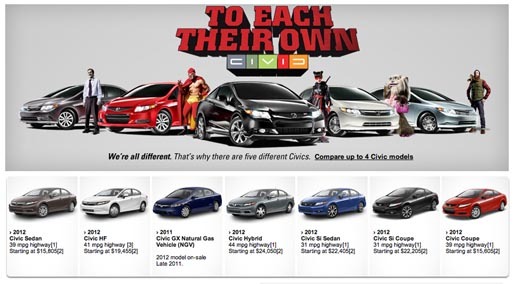 The campaign features five distinct characters, each representing a different model. The Urban Woodsman, Jack, lives in the city but is at home in the woods. 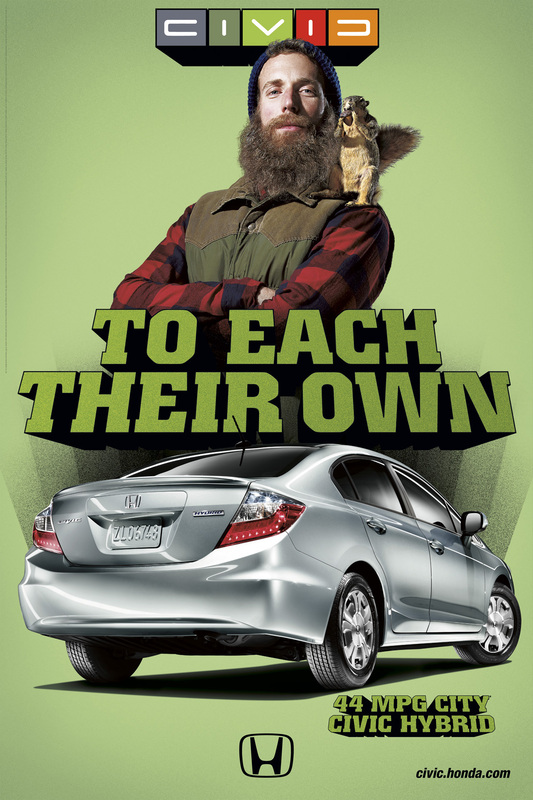 He likes his Hybrid for its great fuel efficiency, which comes in handy on his many trips to the great outdoors. The Zombie, Mitch, is a salesman who’s into high-tech gadgets. His Civic Sedan is loaded with options like Bluetooth HandsFreeLink and navigation system with FM Traffic. The Monster, Teeny, is a bubbly and studious college coed. 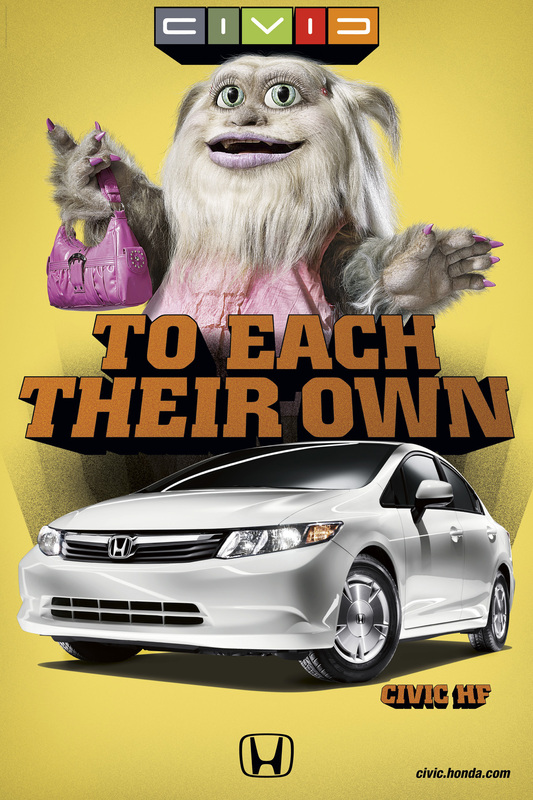 Her practical nature and frugal budget align with the fuel-efficient HF model. The Ninja, Aiko, is cute, innocent and deadly. A martial-arts phenom who’s partial to red licorice and arcade games, she pairs well with the high-energy performance of the Si model. Cesar, the Champion Luchador, is somewhat of a celebrity. He’s handsome, charming and a bit vain so he, of course, appreciates the Civic Coupe’s sleek lines. The Each To Their Own campaign was developed at RPA, Santa Monica, by chief creative officer David Smith, executive creative director Joe Baratelli, group creative director Jason Sperling, creative directors Nathan Crow and Adam Lowrey, associate creative director/art director Jamin Duncan, senior copywriter Sarah Bates, executive producer (content) Gary Paticoff, agency producer Brian Donnelly, assistant producer Faye Armstrong, senior production manager Susan Cockrell and art buyer Ginnie Assenza. Filming was shot by director Guy Shelmerdine via Smuggler with executive producers Brian Carmody, Patrick Milling Smith, Lisa Rich, Laura Thoel, line producer Jay Shapiro, directors of photography Paul Cameron and Kris Kachikis, production designer Brock Houghton, costume designer Casey Storm at Legacy Effects. Editor was Rick Russell at Final Cut, with executive producer Salma Awan, producer Suzy Ramirez and assistant editor Cudjo Collins. Visual effects were produced at The Moving Picture Company by colorist Mark Gethin, visual effects producers Eric McCaslin and Kim Stevensen. Music was supervised at Good Ear Music Supervision. Sound was designed at Beacon Street Studios, by sound designer Paul Hurtubise, producer Caitlin Rocklen, assistant Dewey Thomas. 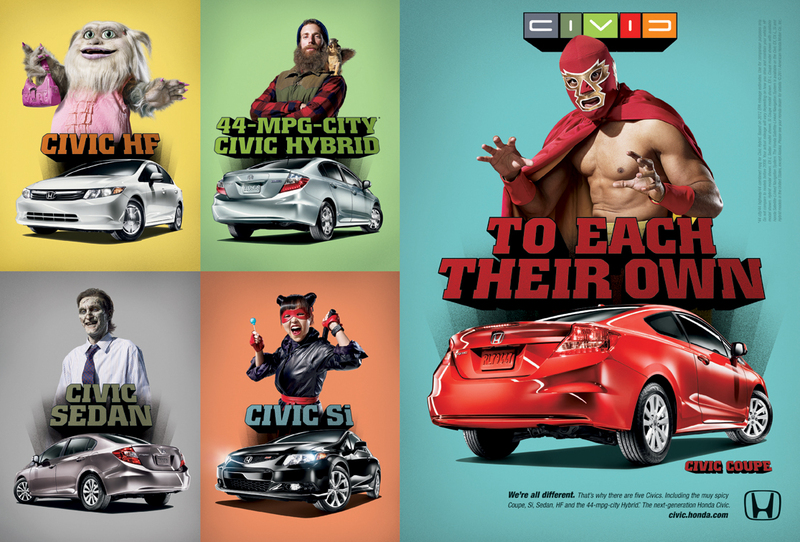 Print ads were produced by photographer Tony D’Orio (characters) and Tim Kent (cars).